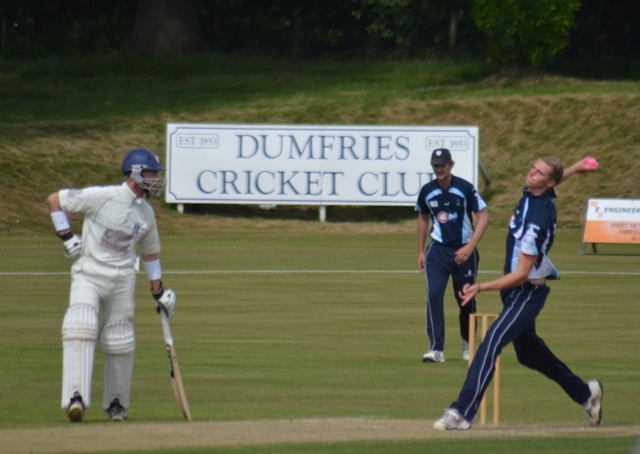 APD Dumfries beat the Scottish Cup holders Heriots by 63 runs in a Scottish Cup group match at Nunholm on Saturday to knock them out of the competition. Dumfries set a total of 250 for 9 thanks to Chris Bellwood top scoring with 61, 60 from the Braidwood Solicitors Man of the Match, Marcus Richardson, and Alan Davidson was one short of a fifty, with 49. The Dumfries bowlers then bowled well to have Heriots at 24 for 3. Peter Lojszczyk took two early wickets and spinner Scott Beveridge later took three to dismiss the Edinburgh side for 187 all out. Also on Saturday Eco-Genics Nunholm lost away at Irvine by 36 runs in the Western Cup. Irvine also scored 187, for 9, off their 40 overs. Keith Walker took two wickets and the Monaghans Jewellers Nunholm Man of the Match, Peter Johnstone also spun his way to four. The young pairing of Chris McBride and Todd Rafferty batted particularly well for 29 and 26 respectively but Nunholm fell short with a final total of 151 all out with six overs left. On Sunday, Good Man Dumfries hosted RH Corstorphine in a friendly at Nunholm. Cameron Leeder dominated the Edinburgh side’s innings of 190 for 6 with a 114 run century. Then a timely fifth wicket century partnership between Marcus Richardson, with 45, and the ETP Electrical Dumfries Man of the Match, Robert McBride, with a commanding 78 not out sealed a four wicket win. The CSL Western Premiership league fixtures resume on Saturday with APD Dumfries at home to Clydesdale. This week the side’s opening bowler, Niall Alexander, has been playing with Scotland U19s with matches against the MCC and a tri-series against Northern Universities in Durham. Scott Beveridge, Peter Lojszczyk and Chris Bellwood also played for the Borders Reivers in their 4 wicket win against the South Holland Seafarers at Ayr this week. The intra-country Challenge Series is a first between Scottish and Dutch Pro teams. Summer Junior Cricket: Club junior coaching sessions continue at Nunholm each Monday through the summer at Dumfries Sports Club, Nunholm, from 6:15-8 and are suitable for beginners. The Club’s Womens’ and Secondary Girls training takes place on Fridays from 5 to 7. For more details contact Trefor Williams on 01387 256455, or contact the Club on 07799 856094, dumfriescricketclub@gmail.com , or see www.dumfriescricketclub.co.uk, @dumfriescricket .